Akram Zaatari The film is entitled The Script because this is a script that has been developed by people, You Tubers, who film themselves and upload their rushes on YouTube. So this is not a choreography or a script that I wrote, but I was inspired by it taking place and unfolding on YouTube and being twisted and changed by different people. You see a man trying to pray, although he is not just trying to pray as no matter how the kids try to interrupt, he continues with his prayer. What I like about it is that there is obviously a choreography written for this, and there has been a rehearsal. So I asked myself, why would people do that? I still don’t have an answer, but it’s amusing and it shows an interesting relationship between father and son, or between grown-up and child. It also shows an interesting relationship between a religious person and an individual (the kid) before they know religion – because at two or four years old, you don’t know what religion is. So for the child, this ritual is more like play, or choreography, and he doesn’t understand why during this particular ritual the father doesn't interact. If the child tries to catch the father’s attention, the father does not react. And this is where I think it becomes interesting, and to try to build on it. It shows a Muslim ritual in the intimate space. There are some of these YouTube films that are set in mosques, where you see a man praying with a child climbing on him. When I saw this, I thought that one day I would like to work with it, and finally the opportunity came up to do that within a larger installation that addresses the attitudes of people in front of the camera, namely on YouTube – as in the four-channel installation Dance to the End of Love. But in this specific case, I do not use the actual rushes. I decided to work on the iconic nature of the film, cinematographically, to do it properly with multiple shots, with editing, and boosting its iconic nature. 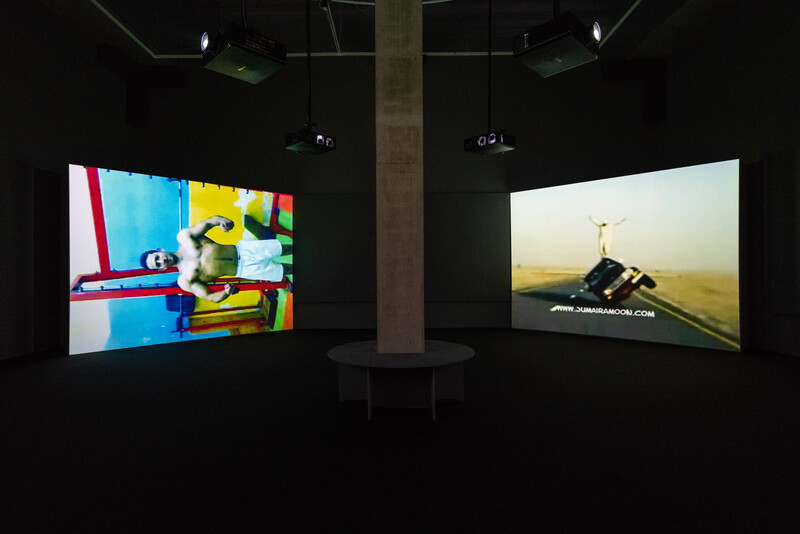 Akram Zaatari, still from The Script, 2018, single channel video with sound, © Akram Zaatari, courtesy the artist and Thomas Dane Gallery, London. Commissioned by New Art Exchange, Nottingham, in partnership with Turner Contemporary and Modern Art Oxford. AD So, effectively, the script itself came from looking at online videos, mostly on YouTube, of men praying with their children. In some of these videos – and you can do a search for them – the child is trying to pray with the father … in others, the child is distracting the father. Can you tell me what brought you to that, because that is a very specific genre? AZ You mean the religious genre? AD I mean father and son praying, because that’s the search that you used. And to be more specific, that search was made in Arabic. If you make that search in Arabic and then in English you get two very different results, or very different videos. You made the search in Arabic. Why that specific search? AZ When I made Dance to the End of Love, I knew I needed to do the search in Arabic in order to get results coming from the Arab countries. So I began searching only in Arabic, when I am researching people’s images of themselves in an Arabic context. 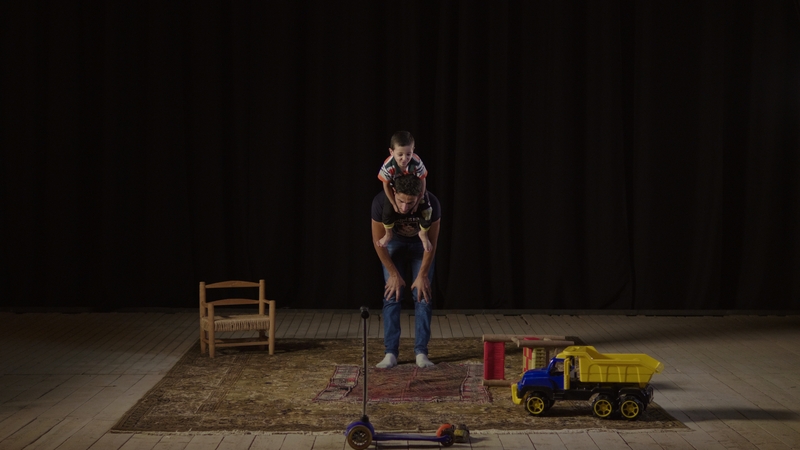 But ‘father and son’ has to do with another project that I’m doing. I’m interested in the representations of father/son in relation to a project about archaeology involving two kings from Phoenician times: Eshmunazar and his father, Tabnit, from around 500 BC. This brought me to this idea of father and son, and to seeing how they figure in one virtual space, like in the space of a photograph or of a film. AD Just to be clear, the father and son Akram is talking about refers to two sarcophagi that were unearthed in the nineteenth century in Saida and which have now been disinterred. One is in Istanbul and one is in Paris, so they don’t actually exist in the same space. But the father and son genre was obviously something that interested you to begin with. Then you do the search on YouTube; and what you find are not a lot of videos – there’s no more than a thousand, maybe five thousand? It’s not like millions of videos. AZ No, you don’t get millions of videos – but YouTube has its own mechanism of making sense of what you type, so not all of them would be ‘father and son’. Maybe some of them would have ‘father/son’ in the text or in the comments... But in the Arab world, father/son has to do with power as well: there are a lot of kings and their children, a lot of presidents and their children, prime ministers and their children! The political elite has tons of fathers and sons too! But putting this aside, I was surprised… actually, I was not surprised, I was amused by the videos of men praying with their children because it involves choreography, and this means that the father has rehearsed with his son before, and therefore this is a conscious moment where the father wants to project an image of the father/son relationship, taking prayer as a chance, as a podium. It involves acrobatics, too, because the child needs to rehearse, and without falling it’s difficult. I’m sure the children fell several times. AD I only noticed today that the elder of the two children is just about to run onto the prayer mat and he stops himself and takes off his shoes! But, obviously, he’s learning. I mean, this is a transfusion of heritage, prayer, feet – but it’s also about devotion to his father … there’s a very interesting relationship there between the secular and the religious. AZ Yes, it’s funny that you mention it, because sometimes you would be filming and you would say ‘3, 2, 1, go’ to the kid, and the kid, while climbing, would say out loud ‘Oh, I forgot to remove my shoes’. So he was very conscious of the fact that he kept his shoes on or not. But that was just an anecdote, let’s say. I didn’t mind if he kept his shoes on, frankly; but he was very conscious of that. AD Obviously the form of the film is very different. If you look online for these specific videos, they’re hand-held camera, there’s no editing. It’s pretty much one take; it’s brief, which is part of the charm, apparently, of YouTube. I was wondering, because you took that material – which is rough, it’s not something that’s got a clear narrative even – you took it, you applied very traditional film-making techniques, which takes it to a completely different level. It gives it narrative, it gives it multiple shots, it gives it multiple edits, you see it from different angles; the viewer has a very different relationship to the act of prayer when it’s filmed by a filmmaker than if you looked at it on YouTube, so there’s a very distinct thing emerging there. And you do it twice: once it’s set in the Zaatari residence in Saida; the other in the Ishbilia Theatre in Saida. Why the two shots? Why the two spaces? AZ One of them is a domestic space, and the second is a performing space, and I wanted to address that slide or that displacement between domestic space and performing, highlighting the fact that we are watching a performance and that this is not a spontaneous prayer. This is a prayer as interpreted through the filter of a filmmaker or of cinema language… it’s going through a cinematic interpretation, let’s say. Hence, the two locations. Also, two lenses are used. We don’t use a zoom lens, we use two prime lenses. One is a normal lens or a slightly wide-angle lens and one is a close-up, and the film is always a shift between these two angles of vision: one is close and one slightly set back. But there’s also something very… the camera is still a witness here. It doesn’t move, it records, and it records from one angle. You don’t see them in profile. It’s exactly like watching a mannequin in a vitrine: you don’t get to see them from the back. The only time when you see them differently is from above, when the father is kneeling on the floor with the son on his shoulders. I wanted the camera to stay outside this bubble, and the only time where you think you might be seeing through the eyes of the father is in the end when you see the seats: the empty seats of the cinema. You imagine that you are already on stage. You don’t see the father and son, but you are already in their previous position, looking at the empty seats. This position of a camera is something that I have done before in other works, where you see action only from one side. AD Something else also happens, because if you do look at these videos online, they’re very specific in terms of their location – usually interiors, people’s rooms. When you made this film, The Script, of those individual uploads, you decontextualise it. It is a relatively anonymous interior domestic space, and a relatively anonymous theatrical space, so it takes it out of its geopolitical location – the countries where it was being made, who was making them. Was that conscious, that you wanted to sort of decontextualise the original footage and make it, dare I say, more generic, more universal? AZ Part of making it and transforming it into an iconic work is stripping it from local nuances and focusing only on the essence of what this is about, so it becomes like a set of gymnastics that you perform in a competition, for example, where you have to do three of that, four of that, two of this. AD And that’s with reference to the prayer itself – [to the audience] I’m sure most of you know, in the Muslim faith, salah is five prayers a day, it’s a very strict sort of routine that you follow. You pointed out to me that the father in this film adds another routine. Because the kid is enjoying it so much and they’re having so much fun, he adds another routine... which is relatively unorthodox. But I want to move on. We’ll return to certain things that we’ve just spoken about there, specifically the notion of excavation. I want to look at Dance to the End of Love, because this was produced in 2011; I saw it in Liverpool in, I think, 2011/2012. In many ways, this would appear to be the reverse of The Script, inasmuch as everything is very specific. The footage has not been scripted, it’s appropriated, co-opted, lifted directly from the internet. There’s no interference; there are subtitles added, but that’s only to the song and so forth. Could you talk a little bit about Dance to the End of Love? Because it happens at a very specific time. It’s an installation in about four different movements, or at least there are four distinct movements. You did use YouTube and various online sites to get the information, but you don’t do anything to it other than create a collage. It’s much more of a musical score; you represent images against one another, but you don’t script it, you don’t make a film of it. AZ It’s also about juxtaposing attitudes that create patterns when seen against similar attitudes. I always make the analogy with photography as well, because many people pose in the same way in front of the camera, and when you see one on its own, it’s singled out and you think, ‘Wow, OK, Anthony is posing in an interesting way’, but when you see that this posture actually exists with so many others, with thousands of others, then it’s not any more singular. It becomes about an imaginary that has to do with culture, with iconography, and with a photographic practice maybe. It’s exactly like when you show me a photograph that you’ve received, let’s say, from Elton John – maybe a postcard that he sent you. And you are so proud that Elton John wrote to you a very singular line, but you realise that he does this with everyone, with all his fans. When you do an exhibition with the same photo and the same dedication repeated over ten years, then it would mean something else. So this, again, becomes about the practice; it tells you something not about the individual, but about the context of the individual, the cultural context. And this is what I’m doing with Dance to the End of Love: I collect attitudes and I try to contextualise them with similar attitudes in other places to comment about the imaginary of this society. AD And this imaginary is quite an interesting one, because as Akram pointed out there – and we will talk a little bit more about Hashem el Madani’s studio – when these photographs… The traditional notion of a photograph is usually that it was located within a region or an area – Saida, for example (the second town of Lebanon, relatively). But with YouTube videos, you have a dematerialised reality. The geography of that is much more extraneous; it’s exploded, it could come from anywhere. And it seems to me with Dance to the End of Love that what you have is a dematerialised digital reality, it’s a community based upon producers becoming consumers of the images that they subsequently produce because they’ve seen similar images. They create this echo chamber. Is that part of that? AZ Let’s call it a community. Yes, there is a community of people, and it’s unlike geographic-based communities where you know your neighbour, you compare yourself to your neighbour and your neighbour compares himself or herself to the third neighbour, etc, and you create a community where traditions circulate and fashions circulate or leak from one house to another. Online communities operate in a similar way. Your friends on Facebook sometimes live in other countries, you know them sometimes but many other times you don’t know them, yet you look at what they’re doing and sometimes they inspire you. You remember when there was the explosion of selfies? We all, living in the 1970s and ’80s, travelled alone sometimes and turned the camera, the analogue camera, and took a picture of ourselves. We never called it a ‘selfie’ and we were not aware of the community that does this. But all of a sudden, when you call it something, you give it an identity … you tag it as the product of a concrete behaviour. AZ Yes. And whoever does it belongs to that community. AZ Yes, people do actually die while doing it. AD Unfortunately… I went searching… and there are certain videos on YouTube you don’t want to see… But there are very specific genres in Dance to the End of Love. When you went searching, did you have any specific outcome in mind or was it a more opportunistic search? Because with The Script, it doesn’t seem opportunistic; it’s very specific. With Dance to the End of Love, it seems more discursive, less prescriptive, and perhaps a bit more about chance or finding what’s there? AZ I was basing my search on different key words, that I had gathered from studio photography actually. AD Can you remind me of the key words? AZ Men flexing, men singing, writing, riding, speed – things like that. I constructed a thesaurus for the photographic archive of Hashem el Madani: all the different postures that were developed in a photographic studio to evoke the idea of romance, of masculinity, of the family, the kiss, father and son, etc. I started with these, typing them into YouTube and seeing what kind of results I would get in moving images. With some you wouldn't get anything, but with others you realised that they are still very active in the imagination of people. YouTube also has the potential of offering you other material that is tangentially related to what you are looking for. It’s always amusing to get lost on YouTube and look at how crazy people can be sometimes. But it is also about loneliness, I think. The people spending that much time filming themselves and putting those images online are very often solitary; it is a solitary practice. AD I think that comes across. There’s a degree of desperation almost in the videos that are being uploaded. This performance of power… it's a very decontextualised masculine power that has no end in itself. It’s not like it’s applied power, it’s the performance of power. I think it's fascinating because that’s the one thing that runs throughout all of the footage in Dance to the End of Love: the performance of power – not power per se, but the performativity associated with power. Do you think that that was an element? Because this is about men ultimately. AZ In some aspects, it is the performance of power – but which is seeking maximum visibility. You always want to know how many views, how many hits you got. It has to do with being popular as well; it’s obviously someone who wants to be popular. AD Dance to the End of the Love – and The Script, of course – but Dance to the End of Love in particular because it isolates a very specific moment in masculinity, and I’m talking specifically about Arab masculinity. It’s 2011, and I’m sure everyone will remember Mohamed Bouazizi, the Tunisian vendor, who in 2010 self-immolates in Sidi Bouzid, south of Tunis, and a conflagration starts in Tunis and spreads to Egypt, and then in January 2011 you have Tahrir Square. At this moment in time, there is a crisis, certainly, and not just in the Arab world. There is a crisis in Arab masculinity, and it seems to me that the film and the footage that you found, consciously or unconsciously, sort of isolates a degree of crisis, a loneliness, a degree of purposelessness: ‘where to next’? This continual performance of stunts… some of the characters in the film have superpowers, which is a very boyhood fantasy, the idea of having superpower beyond yourself, moving things with your mind. And it seems to me – and I don’t know whether you were conscious of this, whether you did it consciously or unconsciously – that it is isolating a very specific moment in recent history in the Middle East through that film. AZ I was very unconcious of it. I did my research in 2010 and the film was almost finalised in December 2010. The opening was in January 2011 – and the day of the opening, the revolution in Egypt started. AD You say it was unconscious… but I don’t think it was that unconscious. AZ When you are very much in close contact with the community that you belong to, it’s inevitable that you absorb much of the surrounding psychological state, or your work conveys that psychology of your entourage or the social context. But I only got to talk about it properly a few months after that. AD Let’s think about something else, because obviously the images that came out of the so-called Arab Spring were mostly around conflict: Tahrir Square, Tunis, Yemen, and so forth… Bahrain. Were you conscious, when you were making Dance to the End of Love – and even more so, The Script – of the types of images that come out of the Middle East? And – I don’t want to say showing another side to the Middle East, that’s too basic – of potentially finding a different way of re-presenting that reality? Or is that too reductive? AZ I think people compete over producing different realities. In an Arab region, there are multiple realities. Very often, they are trying to contradict existing stereotypes. Why is this so? I don’t know; it’s like people are looking for a singular representation of themselves because they are not satisfied with the circulating representations. I don’t want to go into the issue of representation because it’s a whole universe, but all that I can say is that if each one of us wants to work on multiple representations of oneself, you will end up with billions and billions and billions of representations, and we will not be able to seize hold of any reality any more. AD On that note – because I did a bit of research – [to the audience] does anybody know how many films are uploaded to YouTube every day? Any idea? Give me a rough figure. Ten, twenty? Audience Four hundred every hour. AD Four hundred every hour? Interesting. Audience You said that in your essay [which accompanies the show]. AD Oh, from my essay? Excellent that you read it, but you’re cheating! It’s actually four hundred every second. You didn’t read it very well, did you! AD I don’t know if anyone knows, but the very first video uploaded to YouTube – I think it was 2005 – was literally a guy standing in a zoo for nineteen seconds, marvelling that elephants have trunks. It’s that banal. But now, let me just tell you that there are now five billion views a day, according to YouTube: five billion… that’s five billion views per day. And YouTube has one billion users. That’s one-sixth of the world’s population who are engaged with YouTube or communicate through it. If we want to talk about the production of imagery, the reception of imagery, this is where it’s at now. It’s no longer around televisual imagery; it’s around YouTube. AZ Oh, yes… Yemen, that’s from Yemen. AZ I don’t know if it’s Al Qaeda… but I need to go back a bit, because back then I did not exactly know the situation in Yemen. But it’s a training camp for young adults on arms. AD The boy is about ten years old. AD Because this, to me – and again, this is why I said earlier that I think Dance to the End of Love is, in many ways, well ahead of itself… When the revolution, the Arab Spring, happened, we had all sorts of nonsense about the Facebook revolution, the Twitter revolution; absolute nonsense. If you were a shareholder in Facebook, I’m sure you were very pleased to see your market share go up and up and up. But something else happened, of course: ISIS. And ISIS started to use the very networks, the social networks, to spread their particular brand of extremism. And that little clip (it’s only about twenty seconds of the boy, running and shooting), it pre-empts the ISIS videos of beheadings by young children. I was really taken aback by it today because I had forgotten that specific. It’s the one instance of power being applied in that particular installation. And it’s real power; it’s a gun. AZ I make a categoric refusal of promoting or circulating any images of violence, frankly. I always refused to watch any of those beheadings, from those times until now… When I did this research, I did not include any of those, because in my view they are ideologically not individually driven. This young boy in Yemen… it’s really not ideological, it is not contextualised in a certain ideology. I think it was his uncle, or his brother, who was filming him. He is singing, actually. They were filming him singing, and then in the same shot he runs and they continue to film him, so there is this other side to it… it’s like a bonus. AD Excellent. I’m going to leave this discussion of The Script and Dance to the End of Love and move on, but before I leave it I think there are other interesting things that emerged. When I was doing my research, and Melanie [Kidd] and I were talking about the film, there were a lot of things that didn’t get into my essay and one of them was in and around ownership: issues of ownership. Who owns what is uploaded to the internet? I think this comes out very forcefully in both of these films. When you upload an image to the internet, or a film, you no longer own that film. Now that is an interesting thing in and of itself, and it seems to me that in a way, what you’re playing upon there is the lack of ownership of these specific images, which is the exact opposite of a photograph. Somebody owns a photograph, it’s a material object: you own it or the studio owns it. It’s physical; you can touch it, you can see it. With Dance to the End of Love and The Script, ownership seems to be an issue, copyright seems to be an issue. AZ There are two things: ownership and materiality. Ownership and copyright are something else, different from materiality. In analogue photography, there is a primary material that’s either a negative or an original print. The technology nowadays allows you to reproduce a photograph endlessly – exactly the same, one hundred percent the same. Yet, there is still an original and the original is stored somewhere geographically. It has a weight, it will age, it will change, and when it changes it’s no longer what it used to be when you reproduced it digitally. AD The photograph, the material photograph? AZ The photograph or the negative – yes, they do change. A digital image is not the same. Supposedly it doesn't have a weight; it is pixels and data, data that is stored somewhere, data that can be reproduced endlessly, equally. And it is probably also stored centrally somewhere, but this somewhere is multiplied and duplicated in different places. I don’t know exactly how data is stored on the internet, but it goes back to space as well. What is different is that access to this data is much easier than the accessibility of the original material photograph, which exists somewhere with a guardian, someone who is taking care of it. I notice these differences while working with different archives, physical archives as opposed to online archives where things seem to be much more easy and more liberating also. AZ The issue of rights is something else. YouTube has its own version of creative commons licencing that allows you to use images as long as it’s for non-commercial ends. I think the issues of copyright are there to regulate the use of images or music or whatever, and not to prevent this. As a historian – that I would like to be – I always say it’s my right… in the same way that you can write about anything you want, I can include anything in my observations that are made on film. And that doesn’t mean that I am using them in the same way as a commercial film uses a tune to do a commercial for a telephone or a watch or for anything else. I’m using this material to comment on the society that produces them, to comment on the practices that produced them and to subscribe this into a larger visual production that has to do with our times. So I am, in a way, a historian of visual culture – at least, that is my ambition – and I don’t want issues of copyright to deprive me of that, because issues of copyright have nothing to do with access. Once I access these images, they are already in my work and I produce work with it and about it. I am not ‘using’, I am ‘studying’. This is why I developed this notion of ‘objects of study’ in relationship to photographs. I aim to study visual material, and without having it in my work I cannot study it. AD Let’s expand upon that, because I think this is a core point. Akram said he considers himself to be a historian of visual culture. Now, that’s a very interesting idea, when we move from a material age of photographs, physical objects, to a digital age, where you can't touch, you can't hold, you cannot literally go and open a box and find it. I want to rewind and go back to 1997. Twenty-one years ago – have I got that right, twenty-one years? – you started an organisation that became pivotal for anyone working in the Middle East. The Arab Image Foundation, based in Beirut, was a pivotal organisation for understanding not only photography, which it collected, but the economy of circulation and distribution around photography as a practice – the apparatus of photography. Could you talk a little bit about the emergence of the Arab Image Foundation, going back to what you said there about being a historian of visual culture? Because it’s a very specific and very unique thing that occurs in 1997 through to the mid-2000s. AD So it was very local, very specific forms of photography? AZ Yes; we were trying to discover what was there. We took samples; we sampled what’s out there for the sake of creating this archive. It took me about five years to realise that I was interested in chronicling what has happened – historicising, let’s say, photographic practices. But the fact that this already now exists in an archive makes this idea something else. It makes it an existing archive with photographs, and some want to see it as that. 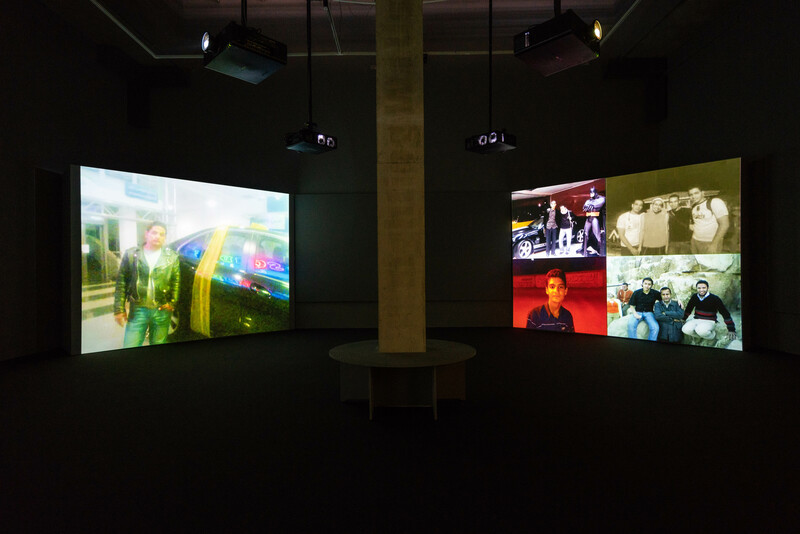 I see it as an archive of collecting practices, while others see it as a record of social attitudes. It is all of those. AD So here’s something I think quite interesting: when the Arab Image Foundation was set up originally, its core function and purpose seemed to have been to collect archives of photographs. But then it became something else, something really interesting; it became an archive about archives. It became an archive of collecting practices, as you said; it became an archive of the cameras that were used, the attitudes and the gestures that you could trace. Depending on what criteria you were applying to the archive, you got totally different results – very different results, for example, if you were a collector wanting to learn about collecting; very different results if you’re about the visual and you want to collect images of people who have taken a photograph and their shadow is in the photograph, which I think is one series? Very different if you’re going into that archive to find images or negatives that have decomposed; that’s another criteria … that’s the bodybuilders series … it’s about images that have decomposed. 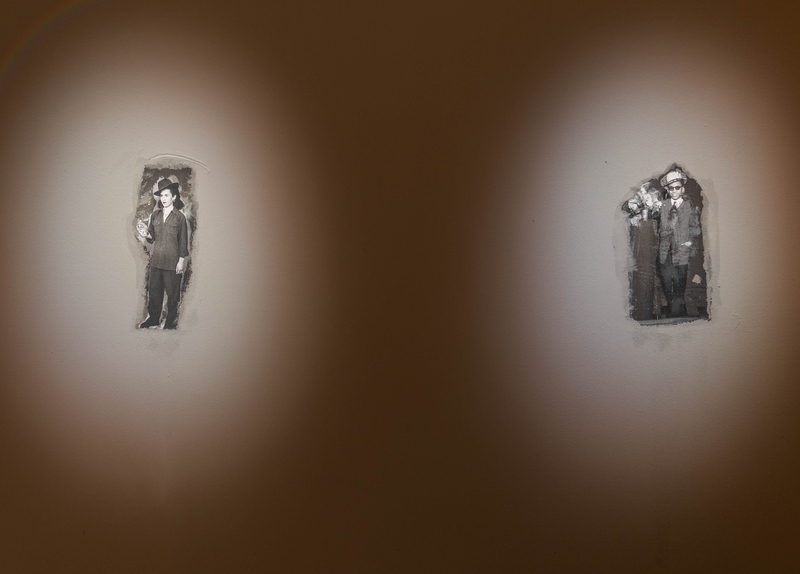 The Arab Image Foundation, to my mind, sets an entire agenda that’s not about photography, bizarrely; it’s about the practice of the archive itself. And that, for me, I think, has left a lasting legacy for not just the Middle East, but for anyone working in this field of visual culture today. What does the archive do? How does it order? How does it categorise? AZ I agree. This is not a question for me, though. AD Are you still involved now with the Arab Image Foundation? AZ I am, yes, of course. I’m not on the board this year, but I might be in the next few years, I don’t know. I just left the board last year. I have a lot to do on my own – I need to work on the rest of the Madani archive because I acquired the rest of his collection last year, and that is a burden in itself. AD Let’s talk about that, because if the audience is not familiar with this it’s quite important that they know about it. The big breakthrough, I think, for you and the Arab Image Foundation was the Hashem el Madani Studio Shehrazade? AD Let’s talk about how you found it, because the studio was set up in 1953. I think it closed in 2017? AZ It stayed open until the passing of Hashem el Madani less than a year ago. AD Can you talk a little bit about that specific studio, and the importance of it for your work? AZ It’s not a unique studio, but it’s the only one from that epoch that stayed open until last year. It’s a typical photographic studio made up of three different rooms. It was a large studio, where people would go and wait their turn to go in and be photographed. Because the studio took more than two hundred pictures a day, and sometimes more, much more: sometimes five hundred pictures a day in the 1950s and ’60s – especially on festive occasions. The studio existed in the same place from 1953 until 2017, with its entire archive. It is missing a few things; some equipment was stolen, for example, but the archives are still intact. Over the years, I transported selections from the archive to the Arab Image Foundation, in coordination with Hashem el Madani, the photographer, up until two years ago, when I had an agreement with him to acquire what remains in his studio, and to acquire his copyrights. AD Oh, I didn’t realise… copyright as well? AZ Yes. It’s a project that means a lot for me, and it’s also a life that means a lot to me. I would like to have it accessible online and open to everyone. I would like it to be used as an example of the work of similar studios in the 1950s and ’60s. Of course, I would continue using this material in shows, like what you see here, that would exemplify or sample attitudes or isolate certain occurrences. Working on the history of a production that spans over seventy years, like Studio Shehrazade, is like walking through different stages of photographic practices… seeing how the industry of photography is changing, how different formats are introduced, how people use this platform that is a photographic studio not only for taking pictures but for transferring or learning. It’s a place where fashions leak, and it’s a place where you go for so many different transactions – like you’ve just bought a camera, you don’t know how to make it work, you go to the photographer and ask him: ‘Can you show me how to work with this camera?’ The photographer will teach you how to load and unload film, how to properly expose images; he wouldn’t get anything in return, except that when you want to develop the film you are likely to bring it to him. He wants to have a network of people who depend on the studio to take their own pictures, so it becomes a place for disseminating knowledge about photography and the culture around photography. AZ …and they ended up scratching them, so they were not useable anymore. So, it’s risky to go to a photographer’s, because it is public… it’s a public place. AD So, if you can imagine that the Shehrazade Studio, Hashem el Madani’s studio in Saida, in the 1950s and ’60s, is not just an archive of images, it’s an archive of attitudes, very specific attitudes. It is also an archive of practices, specific practices based on photography: the practice of collecting, of making. What was interesting with the work that you did on Madani’s archive, there were two things: at one point, you took images that had been, I think, taken by Madani but then they went into the archive in Beirut? This is interesting because they’re being translocated, disposed, or dispersed – but then you took them back to where they’d originally been shot? AZ Yes… images of them, copies of them. AD Could you talk a little bit about that? AZ Photographs take pictures from somewhere and take them somewhere else. This is one of the essences, one of the powers of photography. It brings the Pyramids to London, let’s say, via a picture. This is why you refer to ‘photographing’ as ‘taking’ pictures. ‘Taking’ pictures is ‘doing’ the act of photography. Taking this piece of paper off the table here is just that… there is nothing else to it. But taking your picture means taking a picture of you, producing a photograph via a camera of you, producing a portrait. AD Which can then be dislocated from that spot? AZ Painting is not referred to as ‘taking a portrait', you would say ‘painting a portrait’. You would also say ‘photographing someone’, but the slang is you ‘take a picture’ of someone. I was wondering what returning a picture would mean, if you want to reverse that act. So I picked a group of forty-two photographs that Madani took in the old market of Saida – a project that is interested in identifying the location and the function of each shop that still exists, and then negotiating the return of a picture and hanging a copy of it in the same shop. AD Where it had originally been taken? AD Sometimes forty years later? AZ Forty or fifty, sometimes sixty years later. Sometimes it involves negotiation with a shop… but this is, in a way, commenting on the taking and untaking of pictures. It also has another social side, in that it invites people to look at photographs in the same place where they have been taken, as opposed to in an exhibition in a gallery. AZ Exactly. So people were given a map that indicates exactly where the pictures exist, and they would go into the shop, look at the picture, maybe buy something – a bottle of water, chewing gum or something – and interact with people in the market as well. It was concerned with bringing consumers of photography or consumers of art into a market that they would normally not go to. AD It seems to me that that plays a big role in your work. If I may say so, I don’t think your work on photography is about the image per se. It’s about the back end of the image: how the image circulates, how it functions, how it functions as an economy of production and reception and dissemination, and how the ecology of photography functions, the history of photography, the history of taking images. So the actual substance of the image, what you see, is perhaps the least interesting thing. The more interesting thing is what happens to that object: how does it circulate, where does it go, how does it disseminate, what other economies does it bring into play, what is it a catalyst for, what is it a function for, what moment of exchange happens? Would you agree with that in general terms? AZ Yes, exactly. To highlight, or to add something to what the picture says, you need to go behind it, behind the scenes, or tell the story of its deterioration – so sometimes you need to contradict the recording and say, ‘I’m not interested in recording’. And, of course, this is also a Jean-Luc Godard lesson: in order to see, you need to cover your eyes and see differently. This is an edited transcript of an interview between Akram Zaatari and Anthony Downey, who would like to thank Melanie Kidd, Director of Programmes at New Art Exchange, Nottingham, for facilitating this discussion. We would also like to thank Cindy Sissokho for collating images and other materials. Akram Zaatari has produced more than fifty films and videos, a dozen books, and countless installations of photographic material, all sharing an interest in writing histories, pursuing a range of interconnected themes, subjects and practices related to excavation, political resistance, the lives of former militants, the legacy of an exhausted left, the circulation of images in times of war, and the play of tenses inherent to various letters that have been lost, found, buried, discovered, or otherwise delayed in reaching their destinations. 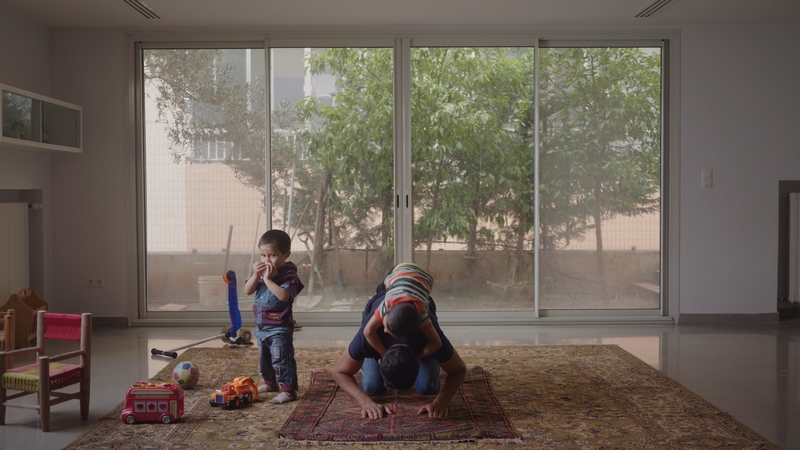 Zaatari has played a critical role in developing the formal, intellectual and institutional infrastructure of Beirut’s contemporary art scene. As a co-founder of the Arab Image Foundation, he has made invaluable and uncompromising contributions to the wider discourse on preservation and archival practice. 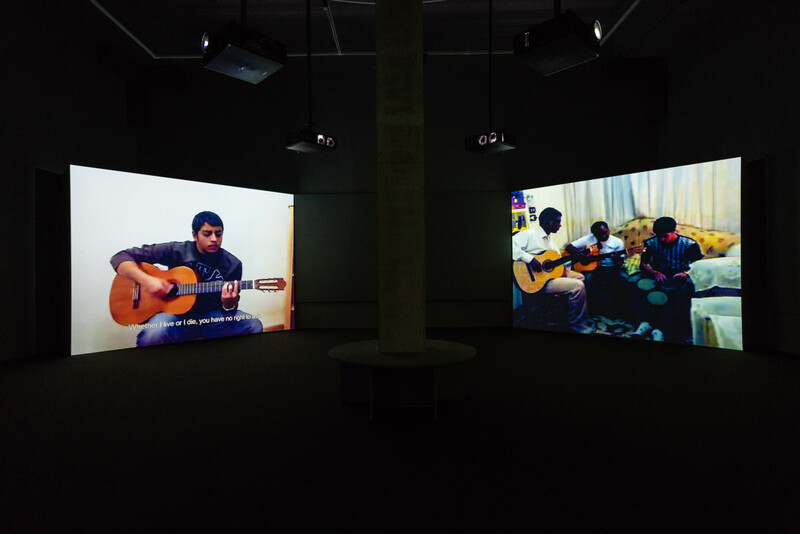 Zaatari represented Lebanon at the Venice Biennial in 2013, and his work was featured in Documenta13 in 2012. His work is in institutional collections such as the Centre Pompidou, Paris; the Guggenheim Museum, New York; the Hammer Museum, Los Angeles; K21 Dusseldorf; MACBA, Barcelona; MoMA, New York; the Serralves Foundation, Porto; Tate Modern, London; and the Walker Art Center, Minneapolis.